Without a doubt the most scenic day of the whole trip. I had to pick up a “Tensor” knee bandage in Prince Rupert before setting off though, as my knee was still bugging me. I had hoped that the rest day on the ferry would have helped more than it did, but I guess I was being optimistic. Putting the elastic bandage on, took a lot of strain off my knee and it actually felt almost painless. The day started cloudy, but then we looked up, and lo and behold, the “Golden Orb” was showing its face! Although it was a 100 mile day, the tailwinds, great weather and lack of major hills made the ride a breeze (pardon the pun). Riding the Yellowhead Highway 16 next to the Skeena surrounded by mountains, waterfalls and glaciers was nothing short of spectacular. The only damper happened at the end of the day, a massive rainstorm, when we were stopped on a hill, fixing a flat on Tim’s bike, just a few miles out from Terrace – typical! Oh no, Tim’s tube patches washed away in the streaming torrent… He inadvertently laid them on the ground for a few seconds and off they went! Our campsite at Ferry Island, in Terrace, was quite soaked after the rainstorm. After pitching our tents, the rain started again, so we cooked dinner in one of the covered shelters that were available at the campground. After more inquisition from Tim and Larry as to exactly when we would see “babes on the beach,” I withdrew to my tent! We all had a good nights rest though, and as it was still damp in the morning, we opted to go to Tim Horton’s for coffee and bagels all round. I think the whole Terrace police force decided on the same idea as the place was full of cops. What’s that about eh? Cops and doughnut shops? We also had to pick up a few snacks for the road, but found out that the local supermarket didn’t open for another half-hour. Two young ladies in the store took pity on us, and let us in early; it was very nice of them and a treat to have the whole store to ourselves! Well my knee felt great, and I found that I didn’t need the bandage anymore. It was amazing how a day of warm weather and easy riding had helped. Unfortunately, Larry still seemed to be struggling and was still lagging behind, so we’d stop and wait for him to catch up every so often. The only problem was that the blackflies wouldn’t leave us alone when we stopped! Still no spare tire for Larry! 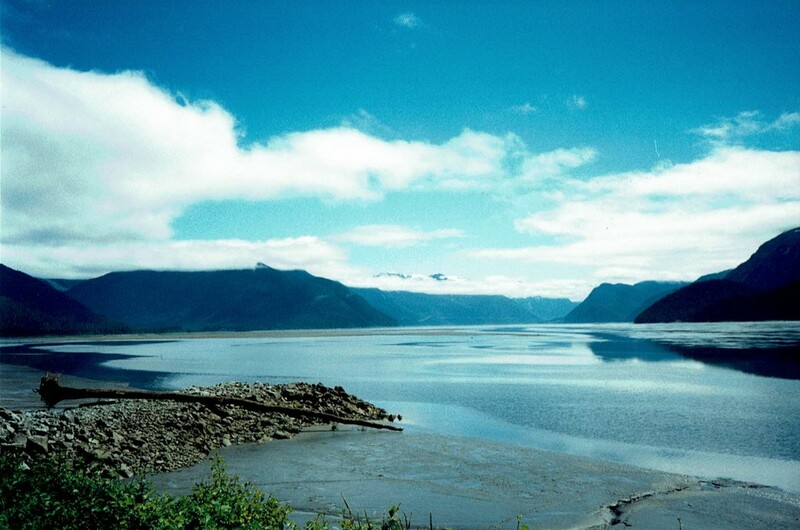 Our destination was New Hazelton but when we were close, Tim remembered being in the area when he was a boy and said that we should go and camp in the old ‘Ksan Indian Village, in Hazelton, which is actually 7 kms north of New Hazelton, downhill and across the Bulkley Canyon. 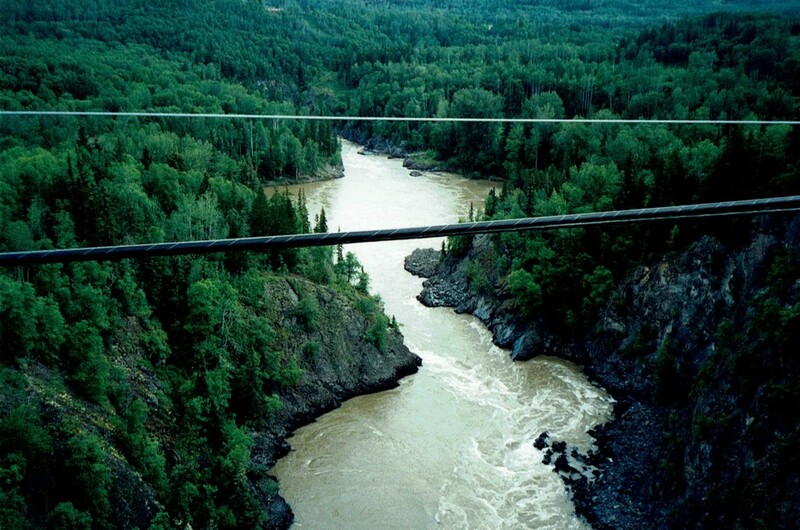 The photo below is from the one lane bridge that crosses above the canyon, over 200 feet up! This was as far north as we would travel and we would start our journey south-east the next day. Yes we had that morning 7 km warm-up hill, thanks to Tim’s nostalgia trip! Why do they build towns at the bottom of hills? Hoping for another dry day, we continued on Highway 16. Smithers was our rest stop and we looked to find that elusive spare 27″ tire for Larry’s bike, no luck! Tim had already changed his back tire and was trying to find another 26″ slick for his bike, which it seemed was almost an impossibility in these northern towns; knobby tire country! One hill of note was a very long climb that we cycled; at the top of the hill was a road sign that read, “Hungry Hill,” well named. After grinding that hill we had an easy cruise of about a 10 km downhill into Houston and stayed at Gerry’s Campground, highly recommended. The lady owner was having a BBQ and invited us all to share in her family’s burgers, hot dogs and salads. All delicious and even the salads were well appreciated. 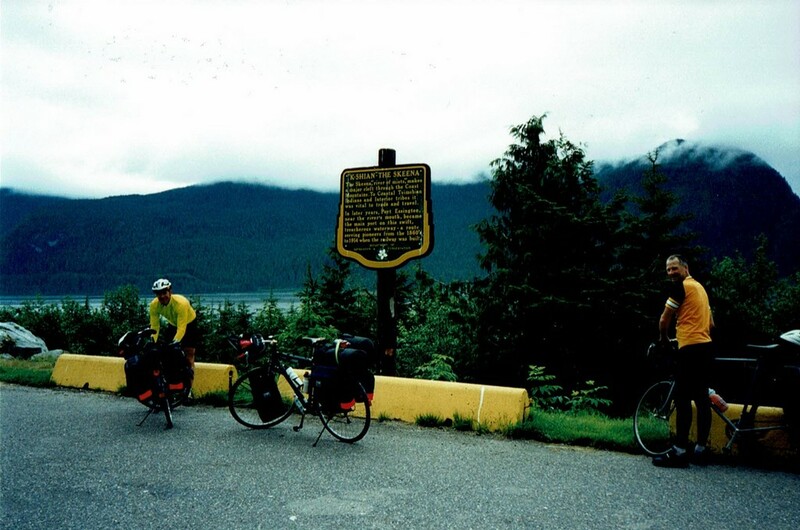 We met up with an Adventure Cycling Association tour group at the campground, they were traveling north from Montana to Alaska heading for the Cassiar Highway (Highway 37). 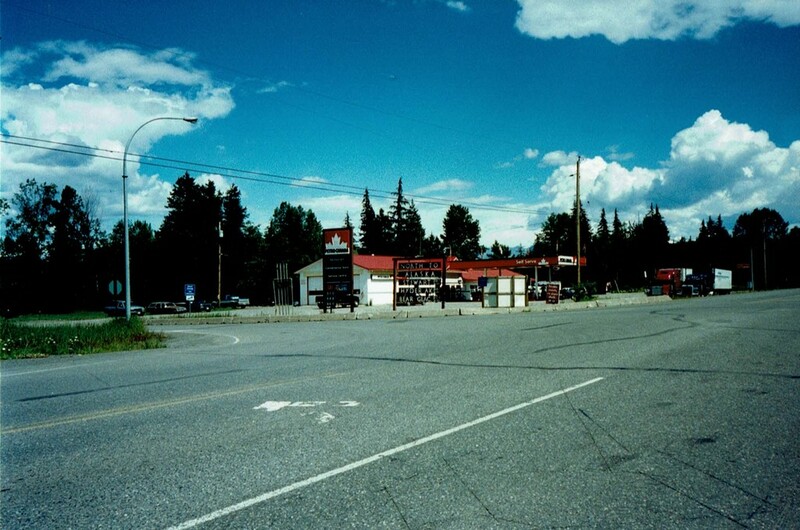 We had passed the junction of 37 on the way to New Hazelton and saw the signs at the gas station stating “North to Alaska.” We mentioned to them that they might meet our friend Eric travelling south on the same route. I still wonder if they ever met up with him? Also, we mentioned about the 10 km climb that they could look forward to in the morning. In return they told us of a similar climb that we could expect heading east; oh joy! Because of Larry’s slower speed, we coaxed him into leaving earlier than Tim and myself, and figured that we would catch him up instead of having to stop and wait for him every so often, thereby suffering the wrath of the blackflies. Anyway, we left about an hour after Larry and found that the morning wake-up hill wasn’t as bad as we were told, or were we just getting used to the climbs? The day, although remaining dry and sunny, was marred by constant headwinds though. 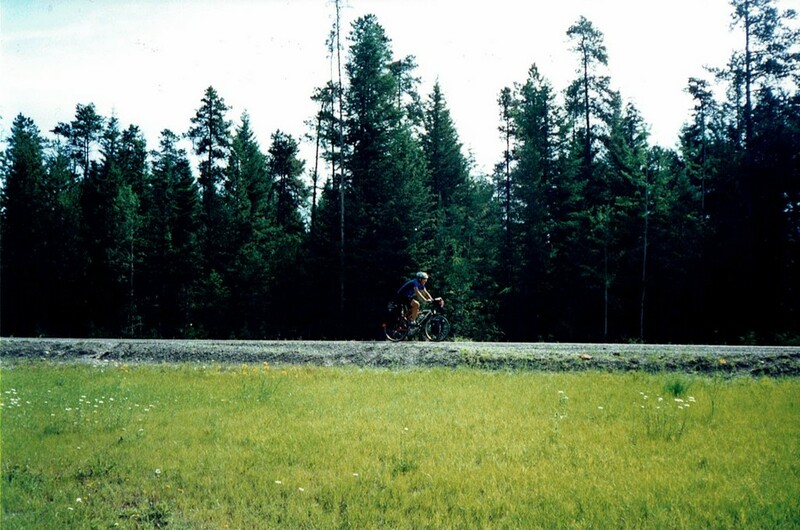 About two-thirds of the way to our destination of Burns Lake, Tim started to hear some unfamiliar noises from his back wheel. He stopped and found that his cassette and bearing were loose. Luckily I had some cone wrenches with me in my tool kit, so we tightened the cone a bit and figured on removing the axle and tightening the cassette later, as we didn’t relish losing any of ball bearings in the gravel at the side of the road where we had stopped; on a hill of course! This turned out to be a mistake, we should have done the repair right away. Further down the road Tim’s wheel almost seized up and the axle nut gouged the inside of the dropout. Figuring that the cones and cups were damaged by now, it was time to look for a bike shop and Burns Lake was only about 15 kms away, so we figured on hitch-hiking a ride, for Tim anyway. With two of us plus the two loaded bikes at the side of the road, no-one seemed willing to stop, so Tim suggested that I leave and see if it was easier for one person to hitch a ride. I didn’t really like leaving him on his own, but conceded to ride to the next rest stop, which according to the map was only 5 kms farther down the road. No sooner that I had left Tim, I looked in my mirror and saw a pick-up truck stopping for him. After a few minutes Tim went whizzing by and waved. “See you in Burns Lake,” I shouted back. I arrived at the rest stop and guess who was there? Larry! I told him our tale of woe and we took off to find any bike shops in Burns Lake, and in turn find Tim. Turns out that it wasn’t too difficult, as there is only one bike shop in Burns Lake; Tim was there, but the shop was closed on Mondays. Yes it was Monday! Luckily there was a bagel shop and deli next door, so we contemplated our next move over some food; that always helps! The owner of the deli said he could contact the owner of the bike store for us and see if he’d come in and repair Tim’s bike. He tried, but no answer, so then he gave us the phone number and said that we should try and call later. Tim phoned a cab for a ride to the KOA campground east of town. Larry and I followed on our bikes and stopped in town for groceries. A mickey of brandy from the liquor store went into my pannier, which I thought would brighten the mood later that evening. We met up with Tim at the campground and he phoned the bike shop owner a little later and managed to talk to him. Figuring that he needed at least a rear hub, the owner said that it would be easier to get a whole wheel from Smithers, as he didn’t keep much of a parts stock himself. Tim agreed and the fellow said that he’d drop by in the morning to pick up Tim and his bike and take them to his shop. Very nice of him. After that we all had a nice shower – not together of course – and a hot meal, followed by some hot chocolate with Napoleon brandy, mmm yummy! (Don’t knock it until you’ve tried it). The world seemed a better place and our troubles were of no great concern! One good thing was that for a couple of days at least, I had not been hounded with the “where’s the great weather and the babes on the beach you promised” query! I slept on that thought! The next morning Tim went to the bike shop, Larry set off early again while I waited at the campground for Tim to return. Eventually he did come back and said that when the wheel arrived it was a front wheel! Great! The bike shop guy then decided to take Tim’s hub apart, and found that luckily the cups had not been scored too badly, so with some new ball bearings and cones he refitted the cassette and everything was hunky-dory. A hot day! Hot? Yes it was true, but headwinds made it a long day for Tim and I, as it was close to 11:00 a.m. when we left Burns Lake. We arrived on the main drag of downtown Vanderhoof to find Larry going the other way. He’d pitched his tent, dropped his gear and was heading for the food store, where else? We did our shopping; the heat even made it necessary to buy a six pack to celebrate the good weather! The young lady attendant at the Riverside Municipal Park was very accommodating and allowed us to pitch our tents on a grassy area next to the actual campground, as all the spaces were kind of gravel and mud; OK for vehicles not tents. A very nice park all the same. The only reason it was damp and soggy (as were many other campgrounds in Northern BC at that time), was that heavy spring rains and run-off from a record winter snowfall, had caused flooding in many of the areas that we were travelling through. These floods had only subsided a couple of weeks prior to our arrival. The same young lady asked us… “How come all you cyclists always have beer with you?” We thought that was kind of funny, as it was the first time on the trip that we had bought beer (brandy yes, beer no), but I suppose lots of other cycle tourists arrived with beer at that spot. So I’m glad we didn’t disappoint her! 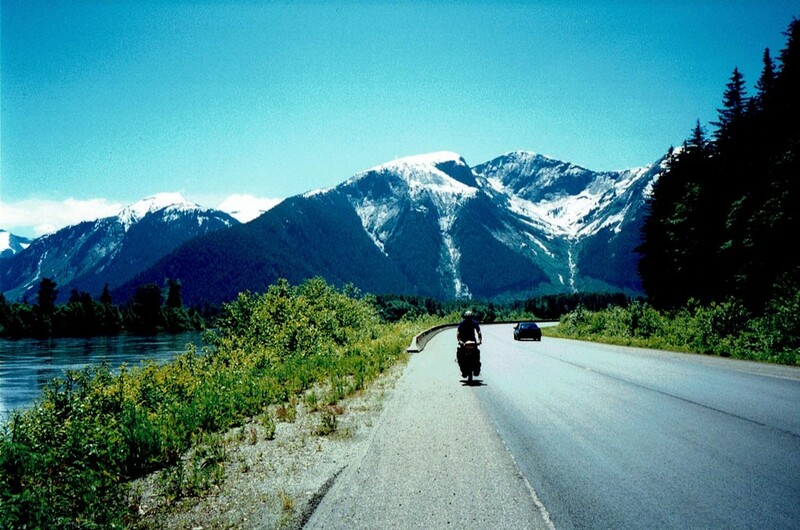 This was our last day on the Yellowhead Highway 16. We were heading for Prince George where we planned to stay for two nights and have a rest day. Larry has an uncle living in this town, so he had previously planned to contact him for a visit. This was the worst day for punctures! Tim had one and I had three in the space of a half-hour! First I ran over a fork, yep, an eating fork, why was it there? Who knows? And the other two flats were a bit of a mystery, but I finally figured out that the end of my Mr. Tuffy tire liner was probably pinching my inner tube. I remedied this the next evening. We passed the Blue Spruce Campground, a few kilometres west of the town at the top of a hill, but the campground we planned on staying at was south of town, so down the big hill and south we went. After checking out the Roblyn Motel & Campground we found it to be more suitable for RV’s, big gravel pads not really good for our tents, plus the fees were really high. So back to the west of town and the Blue Spruce Campground, up the big hill we just went down, we were foolish! This turned out to be a much better choice though and the lady there let us pick our own spot, as once again it was a choice of damp, damper or dampest! At least the weather was finally changing for the better. Larry contacted his uncle Carl and we all went out for dinner together. Carl offered to drive us around Prince George the next day and show us the sights and to take us to the bike shops for our needs.